Blackhawk's Sportster line of firearm cases offer quality on par with the highest quality competitors, all while staying affordable. This shotgun case, made in the USA, is constructed with heavy duty 600 denier nylon with a PVC laminate for added strength and durability. The over-sized self healing zipper and double rows of locked stitching ensure that the case will be a companion for many years. Each carry case features MOLLE webbing while interior closed cell foam provides some floatation support. 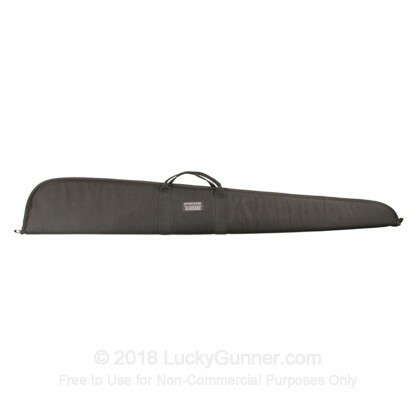 This Blackhawk Sportster carry bag will fit shotguns up to 52" in length and is an excellent choice to protect your firearm from unwanted damage and debris. This case measures 53" L x 8" H x 2" D.
This will work really well for non-scoped long guns, but anything with an optic you can't zip the zipper. I was looking for a cheaper, but well made case for my Remington 870 Tactical shotgun since I was lacking a case when I purchased the shotgun. This case allows for secure carry to the range and is the perfect size. Good case for a good value, I couldn't ask for more.